The very first entry I posted when I began this blog on July 9, 2005 - hard to believe that the 10th anniversary is approaching - dealt with the specter of eminent domain on the Westside of Costa Mesa. This entry was on an old blog host - which I've described as a bargain basement blog host - without the ability to post comments. I changed hosts to the current Blogger format 18 months later. If you want to read any or all of those old entries, there's a link over on the right of this page that says "A Bubbling Cauldron (7/05 - 10/06)". Just click on the title or on that link, then scroll down to the bottom of the page and navigate through the various entries. Or, go over to the "Archive Index" on the left side of the page, click on it, then look for something of interest. It's cumbersome, which is one reason I changed hosts. Anyhow, I thought you might find what I wrote back then to be of interest, so I've copied and pasted that entire first entry below, just as it appeared then. It was published just before 3 p.m. that afternoon. Enjoy. In case you're wondering, here's what the folks visiting Trader Joe's, between Superior and Pomona Streets along 17th Street, see as they head for the parking lot entrance. Today, Friday, January 9, 2015 is the first National Law Enforcement Appreciation Day (L.E.A.D.). If you do a Google search on that subject you'll find that cities all over the country are recognizing the men and women who go to work every day to keep us safe. Apparently not in Costa Mesa, though. I searched the City web site and found no mention of this event. I checked the web and found nothing. I did find a reference at the Orange County Sheriff's Department web site about this day, HERE. 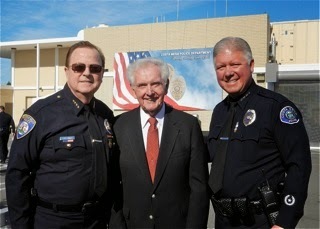 It deeply saddens me to think that the relationship with the men and women of the Costa Mesa Police Department and the city government where they work has deteriorated to such a point that no mention, no recognition, is made on this national day of appreciation to a law enforcement officers by the city in which they literally lay their lives on the line every day. The picture here was taken as the CMPD recognized it's 60th Birthday. Click on the image to enlarge it. The crowd shown here has thinned significantly since the day this photo was taken. Men and women continue to depart faster than they can be back-filled, causing horrendous hours of overtime to be worked by those who remain in order to keep us safe. So, today - even though The City Of Costa Mesa chooses not to participate in this event - wear something blue, put a blue bulb in your porch light if possible for the next week and thank a cop if you see one. Despite the controversy swirling around due to the lawsuit filed against the men and women of the CMPD by the mayor and mayor pro tem - no member of the CMPD has been charged with any crime - those brave folks continue to show up for work and do their very best for us. Thank you to Acting Police Chief Rob Sharpnack and the men and women of the CMPD. Let's be careful out there! Group Home Applications Available Now! Today the City of Costa Mesa announced that permit applications to operate group homes in single family neighborhoods are available and will be processed in the order received. You can read the full text of the announcement HERE. One of the interesting elements is the repeated reminders to submit COMPLETED applications or suffer being shoved to the end of the line once the rejected application is complete. Watch for the stampede of applicants. Also of interest is the actual application and related materials, which can be viewed HERE. Even if you don't plan to defile your own neighborhood with one of these places, I think you'll find reading the application and understanding the process to be quite enlightening. It's going to be very interesting to watch this latest litigation nightmare play out. 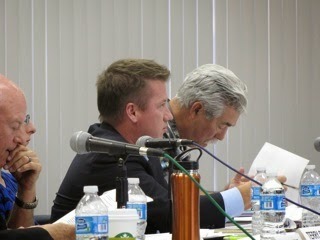 One more chance for attorneys to pad their retirement plans thanks to the taxpayers of the City of Costa Mesa. 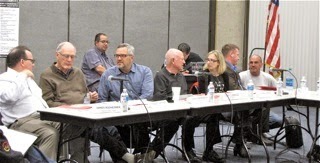 City Announces New Mayor's "2015 Listening Tour"
Today the City of Costa Mesa announced a new program designed to provide five ways for residents to meet Rookie Mayor Steve Mensinger. I've posted the entire text of the announcement for your reading pleasure below. I've spoken with Sharon Rodelius from the CEO's Office this afternoon. She's running point on this program. Although the City announcement does not require a call to schedule a time to meet with Mensinger on Sundays, she agreed that it would be a good idea to give her a call so they can plan that two-hour segment beginning this Sunday, January 11th. I guess you'll just wander into the City Hall lobby and take the elevator directly to the 5th floor bunker, er, Executive Offices for your chance to chat with the Rookie. It's also unclear whether there will be dancing on the brand new hardwood floors in the Mayor's palatial, newly-renovated office. Nor is it clear whether he will be tossing that football around with you, either. As far as we know now, this will be a one-on-one chat opportunity. So, you can meet with him on a Sunday; waddle with him on a Friday morning; slurp coffee with him at a time that works for both of you; drop him a little note at the brand new email address or invite him to visit your business, event or whatever. Costa Mesa Mayor Steve Mensinger has announced a “2015 Listening Tour” to allow residents five ways to more easily access to City Hall and share their hopes and concerns with the mayor. Meet the Mayor. Mayor Mensinger will hold “Meet the Mayor” sessions at City Hall and other locations around town from 2 to 4 p.m. on the second Sunday of each month. The first “Meet the Mayor” will be at City Hall (77 Fair Drive) on Jan. 11. Walk and Talk with the Mayor. At 5:30 a.m. on the third Friday of each month, residents can participate in the “Walk and Talk with the Mayor” for approximately a 90-minute walk. 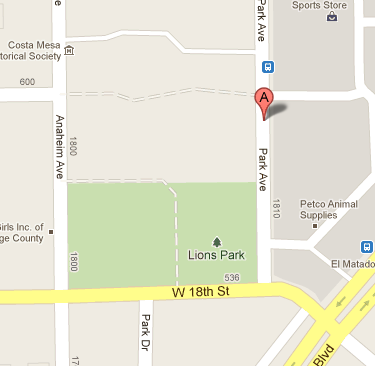 The group will meet at the Estancia High School parking lot (2323 Placentia Ave.) adjacent to the tennis court. Coffee with the Mayor. To set up a meeting over coffee, please e-mail Mayor Mensinger (mayor@costamesaca.gov) or contact the City Council’s executive secretary, Sharon Rodelius, at (714) 754-5107. Write the Mayor. E-mail the Mayor Mensinger at mayor@costamesaca.gov and you’ll get a response back within 24 hours. Invite the Mayor. Schedule permitting, Mayor Mensinger would love to accept your invitation to ribbon-cuttings, nonprofit meetings, public or private school classes on local government and more. To schedule an event, please e-mail Mayor Mensinger (mayor@costamesaca.gov) or contact the City Council’s executive secretary, Sharon Rodelius, at (714) 754-5107. For more information about the “2015 Listening Tour,” please call the City Council’s executive secretary, Sharon Rodelius, at (714) 754-5107 or email her at sharon.rodelius@costamesaca.gov. It's going to be very interesting to see how this scheme plays out. Cynics might suggest that this is a way to try to diffuse critics privately, without all that nasty inquiry during official, on-the-record, public comments during council meetings. I have no doubt that meeting with your top elected leader to discuss issues that are important to you is a good thing. However, it might seem to some that this is another step to mute public criticism. We'll find out soon enough. Fairview Park Committee Chairman Resigns! At the end of a meeting of the Fairview Park Citizens Advisory Committee Wednesday evening, following three hours of contentious public comment and spirited discussion between the members of the committee, Chairman Dr. Richard Mehren - the man who was largely responsible for the City of Costa Mesa acquiring the Fairview land originally and who was the chairman of the first Fairview Park Advisory Committee for seventeen years in addition to manning the helm of this committee for nearly two years - abruptly resigned. 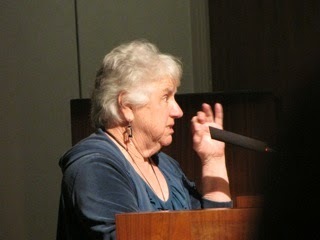 Dr. Mehren, who has been very clearly in favor of keeping Fairview Park in a natural state and obviously opposed to any of the schemes proposed to convert all or part of it into active sports venues, chose to close the meeting with a prepared statement, part of which included a comment that it "was something I've wanted to say for some time." 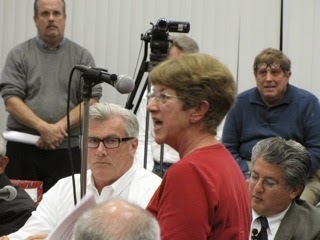 As we leaned forward to hear because many of the members of the audience and the committee were already in departure mode, Mehren said, "This committee should never have been called the Fairview Park Citizens Advisory Committee, it should have been called the Fairview Park Mayor's Advisory Committee because the mayor stacked it with six members who were in favor of playing fields." And with that he gathered up his papers and left the room, leaving dropped jaws behind him. As Mehren departed one audience member near me muttered that "At least one of them has some balls." I had to smile because that "mayor" - now Mayor Pro Tem Jim Righeimer - was at the table as primary liaison to the committee for the first time. I suspect he was not happy. According to Deputy City Attorney Yolanda Summerhill, who provides staff legal support to the committee, the committee members must select a new Chairman at their next meeting. The City Council must now decide whether to replace Mehren and the process to be used. When member David Stiller, who was not in favor of playing fields in the park, passed away last year the council replaced him with Frank Davern, who is in favor of playing fields. Mehren's departure has the high probability of further shifting the balance on the committee if another person favoring playing fields in the park is chosen. It all may be moot, since this committee has almost wrapped up it's assignment after nearly two years of meetings. As anticipated, even without Mehren's departure, this meeting had plenty of other drama. First, it played to a standing-room-only crowd. 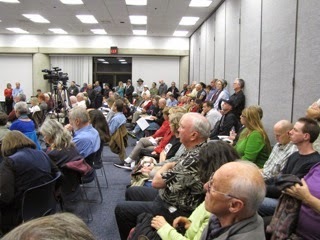 Seats were provided for 100 people, but more than 150 packed the venue until one of the walls was removed late in the proceedings to provide seating for them. 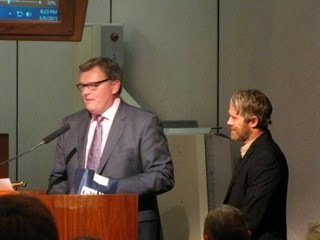 Bradley Zint of the Daily Pilot and Jordan Graham of the Orange County Register were in attendance. You can read Zint's article HERE. 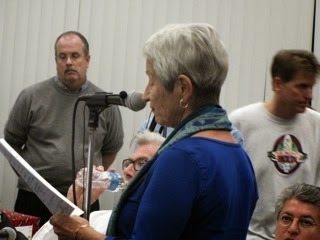 During the Public Comments segment of the meeting that began shortly after the six o'clock start time, more than three dozen people spoke. More than 90% were clearly against placing any playing fields within the boundaries of the Southeast Quadrant - or anywhere in the park, for that matter. Those who spoke in favor of playing fields were representatives of youth sports organizations, each of whom bemoaned the dearth of adequate fields within the City. A few acknowledged that the shortage was actually of lighted fields for the most part. That issue is NOT within the purview of this committee's scope of work, although it is foundational to the attempt to snag some of the land within the park for fields. Many of the speakers have become regular attendees at these meetings and spoke with gusto and concern. There were more than a few new faces, though, who addressed the committee with passion and trepidation. 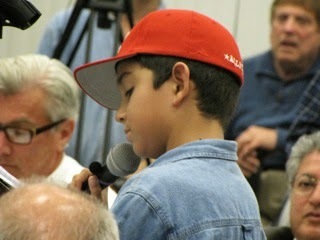 One young fellow, James DeLaO, marched right up to the microphone, held it in his hand and told the committee that, while he was a baseball player, he didn't think there should be playing fields at Fairview Park. Interestingly, his father later spoke and advocated for fields in the park. One interesting speaker early in the segment was Vicki Snell, new Newport Mesa Unified School District Trustee for Area 1, which is part of Costa Mesa. She had the unenviable task of delivering to the committee the letter signed by District Superintendent Dr. Fred Navarro and Board President Martha Fluor, which I mentioned in my earlier post, HERE. A copy of the letter is contained in that entry. As it turns out, the letter may not have been what it appeared to be, according to Snell. It appears that Navarro and Fluor may not have actually understood what this meeting was all about, and what the charter of this committee actually is. After her brief 3-minute presentation she was asked by Vice Chairman Steve Smith to step back up and read the letter into the record in it's entirety, which she did. A later speaker, Laurene Keane, told us she had been in contact with Fluor during the day and affirmed that the letter was not what it appeared to be. Of course, that's problematic, since we have the two highest ranking people in the school district firing off a last-minute missive to the committee, city council and Parks and Recreation Commission without a clue. I suspect they, did, in fact, understand what they were doing and may use this event to leverage some kind of change - monetary or otherwise - in the Joint Use Agreement. We'll see. I've been told by some sources who should know that the City should probably be contributing substantially more to the District for maintenance of fields than is presently prescribed in the JUA. By the way, 4/5 of the Parks and Recreation Commission were in the room during this meeting. Chairman Byron de Arakal and Commissioner Don Harper were in the audience and Dean Abernathy and Bob Graham were at the committee tables. I did not see Commissioner Kim Pederson. Suggestions from speakers included carving up part or all of one of the two municipal golf courses to use for playing fields. Others suggested the pending availability of all or part of the Fairview Development Center as possible venues for sports fields. Still others suggested that any attempt to carve up segments of the park would likely violate the trust deed in force from the purchase. Others observed that artifacts from Native Americans were all over the park and properly assessing them and mitigating possible damage could take years and hundreds of thousands of dollars. Resident and almost councilman Jay Humphrey spoke to the committee and reminded them of the legacy they will be leaving for their children, grandchildren and their children, too. He suggested anything that would place hardscape - paving, etc. - would damage that legacy. 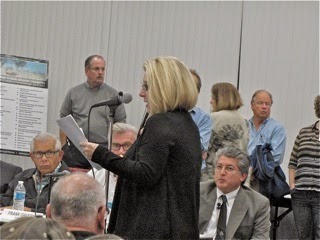 Professor Patricia Martz - a frequent attendee to these meetings and archaeologist of some renown - reminded the committee of protected areas within the park and, specifically, within the Southeast Quadrant. 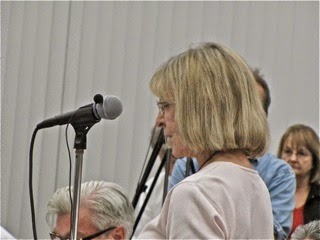 Kim Hendricks, a teacher with a passion for the park, again spoke and quoted from the current Fairview Park Master Plan to remind the committee of the constrictions they're working with. At about 6:35 Mehren arbitrarily decided that speakers would now get only two minutes instead of three because it was his intent to begin the business part of the meeting promptly at 7 p.m.
Public Comments ended at 7:15. 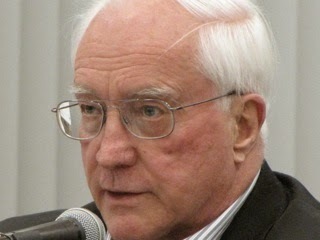 Then member Ron Amburgey - who was one of two members who originally had most of the 35 original items place on the list - suggested that all six should be considered at one time. After some discussion by the committee it was decided to split the items into three distinct groups for consideration. Those would be items 1-3 in one group; item 4 by itself and items 5 and 6 as a group, so that's how they then proceeded. Before they began public comments Mehren told the committee and audience he felt all the items violated the Fairview agreement and would vote NO on all of them. The crowd cheered. Sixteen people spoke during the "comments" segment of the discussion of items 1-3, although several used their time to speak on broader issues that they couldn't cover earlier due to time constraints. Sometimes the will of the people seems very much like water. Even though you might attempt to dam it up, it can usually find a way past that dam. 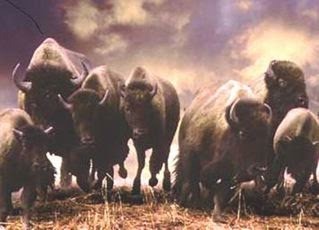 They spoke of the loss of habitat for animals in the park, the use of water to grow playing field grass, the damage grading would do to Indian artifacts. 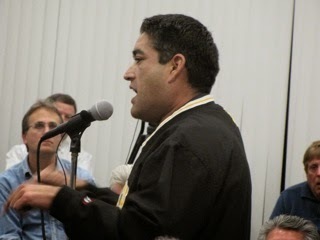 One speaker reminded the committee that splitting the elements for discussion won't mitigate the damage done. 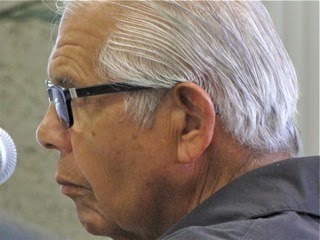 One speaker, who said he was a tribal leader of local American Indians, spoke vehemently against any development in the park and, at one time, looked directly at Righeimer with a comment about development. Righeimer brusquely told him to "speak to the body" - ever the class act. The ratio for and against fields in this segment was the same as earlier. After more than 20 minutes of public comments the committee then began discussing those three items. Smith reminded them that the 8 o'clock hour was approaching, so the time was extended to 8:30. It would later be further extended to 9:00. Brett Eckles - a strong advocate for playing fields - tried to be the voice of conciliation and asked for compromise. He attempted to provide some valid statistics for the committee to consider, and spoke of the need for more maintenance of existing fields. The ever-pompous Dennis Popp suggested that he needed more expert opinion from Civil Engineers before making a decision to recommend fields or not, so he wanted to shove these three items forward so the staff could bring back more information. He attempted to cite his nurse training, but - as is usually the case when you try to read his pathetic blog - he just didn't make any sense. Of course, it didn't help his case much when he accused the audience of being immature and scolded them for their behavior. Lee Ramos, in one of the few times he's spoken out on issues, went off into what sounded like a deflated version of his campaign stump speech, during which he made a back-handed comment to Mehren and closed by reminding folks of his Hispanic heritage - "my culture owned this land at one time" - before stating that "we need to find a way." Later a speaker looked directly at Ramos and spoke of a man who had recently come to her door campaigning and told her flat out how he felt about issues in Fairview Park, then voted the opposite tonight. She was fuming! Fortunately, enough people saw through Ramos' campaign rhetoric and did not vote for him in November. 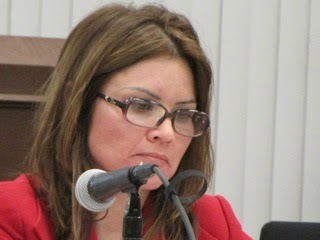 Anna Vrska observed that this committee, while it includes many fine people, has been a waste of time and resources. She observed that they had not been provided with sufficient or accurate information with which they could make decisions. I was not surprised, since she has regularly asked for statistics from the staff which seemed not to be provided. Finally, just after 8:30, the committee voted, 5-4, to ask the staff to bring back an analysis of those three items for the committee's consideration at the next meeting. Ramos, Popp, Amburgey, Eckles and Davern voted YES. Mehren, Smith, Anna Vrska and Terry Cummings voted NO. Following a discussion of item #4, the expansion of the Orange County Model Engineers footprint, Ron Amburgey moved to approve it, but received no second, so it died and will receive no further consideration. Items 5 and 6 received a similar fate. Seven members of the public spoke to this issue - none in favor of moving them forward - and Amburgey could receive no support for his motion, so it died for lack of a second. 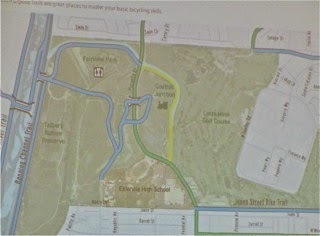 I was astounded when they actually began the final agenda item, a discussion of the East Fairview Channel Trail, shortly before 9:00. I thought for sure they would shove that item off to the next meeting. Nope, Mejia delivered a short staff report, showing maps, etc. and no members of the public spoke. THEN it was decided to put it off to the next meeting. Then Mehren delivered his bombshell news and Smith adjourned the meeting. Whew! So, back we come next month, on February 4th, when a new Chairman will be selected and the future of this committee will be clarified. 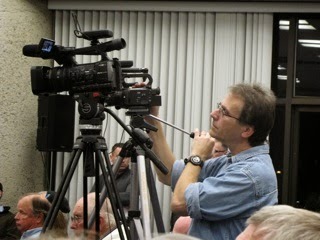 Almost forgot... Barry Friedland was on hand with several cameras to capture the evening's event. He tells me that the video of this meeting should be up on his Costa Mesa Brief YouTube Channel, HERE, within the next couple days. Look for it Friday. Late yesterday the Newport Mesa Unified School District threw a stink bomb into the proceedings of the Fairview Park Citizens Advisory Committee meeting scheduled for this evening at 6 p.m. at the Neighborhood Community Center. That aromatic delivery came in the form of a letter from Superintendent Dr. Fred Navarro and School Board President Martha Fluor. I've reproduced the letter below. Click on the image to enlarge it. Although there is no specific mention of it in the letter, his last minute bombshell implies that the school district apparently is tired of their relationship with the City in the form of the Joint Use Agreement between those two entities regarding the cooperative use of school fields. 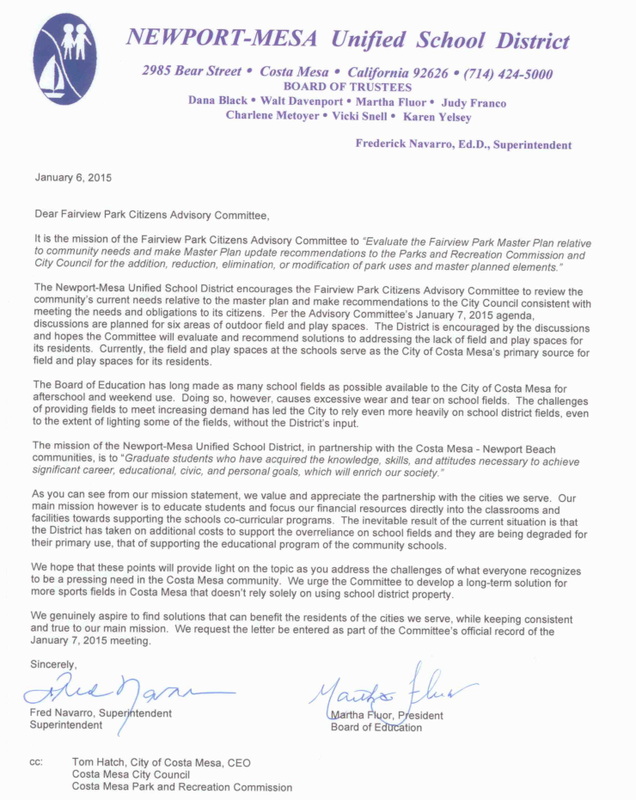 The implication anyone reading this missive is that the school board expects the Fairview Park Citizens Advisory Committee to recommend converting part of that natural park into playing fields. Committee Vice Chair Steve Smith has signed in on this issue with a blistering blog entry, which can be read HERE. His perspective is important to consider because of his proximity to school district finance issues over the past few years and because of his leadership role on the Committee. He's been an outspoken critic of how the district manages it's cash. BAILING OUT OF THE JUA? According to some sources, this may be a preamble to the school district trying to bail out of the JUA, and that it may be trying to figure a way to do it without too much political damage. Well, let me tell you... this letter seems not to be the most tactful way to begin that kind of a conversation. It is our understanding that brand new School District Trustee Vicki Snell will be delivering the letter to the Committee tonight. So, as if this meeting already didn't have enough drama on the agenda because of the consideration of a variety of potential active sports proposals which pits environmentalists and others who wish to keep Fairview Park natural against advocates for more active sports fields on the site, this new element is certain to draw a crowd - probably an unhappy crowd. I wrote earlier about this meeting, HERE. I suggest you arrive early and, if so moved, be prepared to address the Committee during the Public Comments section, which falls early in the agenda. Again, the meeting is scheduled to run from 6-8 p.m. in the Victoria Room of the Neighborhood Community Center, 1845 Park Avenue (Lions Park). See you there. New Mayor Steve Mensinger flexed his muscles and showed off the new speaker timer system last night as he went about changing the rules of the road for comments at future council meetings. Brad Zint, diligent reporter that he is, beat me to the punch with his Daily Pilot coverage, HERE. 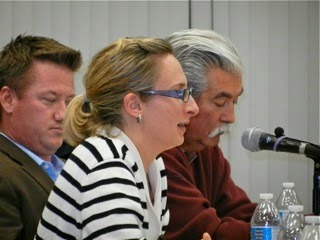 The issue was the final item on the brief agenda, but Mensinger seemed determined to run an "efficient" meeting. The first time he said that word I began to worry about thoroughness and fairness being lost to efficiency. That's still going to take some watching at future meetings. 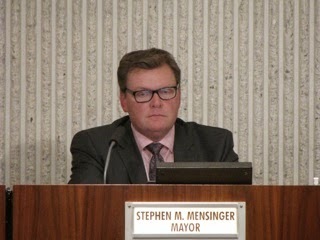 During the 50 minutes it took to vet Mensinger's proposal - which included changing the start time of future council meetings to 5:45 from 6:00, providing 40 minutes for Public Comments and limiting council comments and suggestions to 3 minutes per member - a dozen members of the public spoke to the issue. 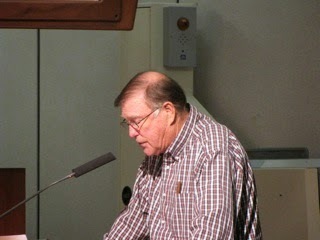 Only one, prodigal son Ken Nyquist, who made the 275 mile round trip down from Joshua Tree to address the council last night, was supportive of the plan. All the others had problems with one or more of the elements of the changes. Complaints ranged from the inability of some speakers to drive from work, cook dinner for their families and still make it on time for Public Comments. Others complained about the current speaker card system, which requires that anyone wishing to speak fill out a card before the first speaker begins. Still others felt the council members should not be restricted to 3 minutes. 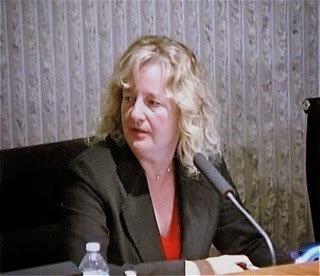 Others took exception to Mensinger's characterization that the Public Comments needed to be wrapped up so the council could address "The People's Business". 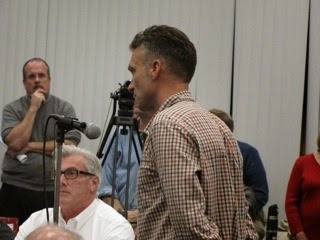 Several reminded him that Public Comments ARE the "people's business". Katrina Foley, as described in Zint's article, balked at the three minute limitation. The council eventually agreed with her. All committed to make their comments as brief as possible. So, no 3-minute limitation for council members. No requirement to submit speaker cards for Public Comments PRIOR to the first speaker beginning. Speakers may submit their cards any time during that 40 minute period from 6:00 to 6:40. Those who wish to speak but couldn't do so in the prescribed time may do so at the end of the meeting. Speakers will still be limited to 3 minutes. And, yes - future meetings will begin at 5:45. 2. The City Council will hold regular meetings on the first and third Tuesdays of each month at 5:45 p.m. If there are closed session items, the regular meeting will convene at 5:00 p.m. for consideration of those closed session items. Following the deliberation in closed session, the regular meeting will reconvene at 5:45 p.m.
3. Members of the public desiring to speak during the Public Comments period will be asked to submit their speaker card at the beginning of the regular meeting prior to the first speaker. 4. Members of the public desiring to speak on a consent calendar item will be asked to submit such a request on a speaker card prior to the start of the Consent Calendar period. 5. A member of the public who timely submitted a speaker card but did not have an opportunity to speak during the Public Comments period will be given the opportunity to address the City Council at the end of the meeting. So, the Big Dog got most of what he wanted and the public got a win, too. No restrictions on council comments; ten more minutes at the beginning of the meeting for Public Comments - which may permit most of those intending to speak to do so - and the elimination of Righeimer's onerous, heavy-handed speaker card system. We're going to have to adapt to the earlier start time, but, all things considered, it turned out OK. Now we'll see how it actually works. YOU BETTER FINISH ON TIME! Before we leave this subject, up top I mentioned the new speaker timer system. Well, according to those who actually do step up and speak, it's better than the previous system because it gives you a digital countdown so you can time your presentation better. Good thing, too, because if you exceed the time permitted the new tone that sounds to let you know is loud and obnoxious - like a ship horn bearing down on you in the middle of the night! 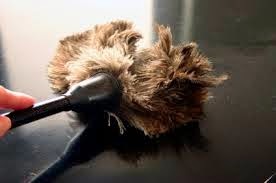 It's kind of like aversion therapy - speak too long and you'll get an auditory slap on the wrists, except this tone is more like a punch in the face. HELLO, STEVE! ARE YOU THERE? As an aside, I had to chuckle when, in the middle of one of Righeimer's long rants, Mensinger's cell phone rang and rang. We should make the dais a "phone-free" zone for the duration of meetings. No wonder he has a hard time concentrating, for goodness sake! There was other business, too. New Business #1, the addition of the BLVD Hotel to the BIA was addressed quickly and approved. 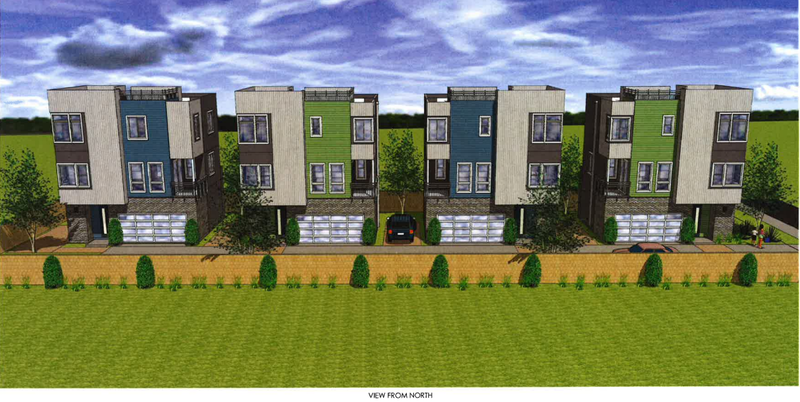 #2, the screening request for a development at 2068 Maple Avenue received a thorough vetting before it moved on. 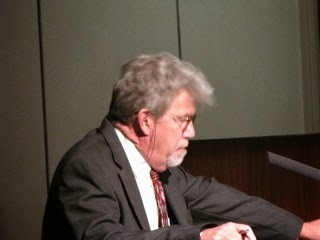 Former Development Services Director Don Lamm was the consultant on the project. It will be back, before the Planning Commission, as the developer tries to shoehorn in 4 units on a tough-to-build-on lot. The Public Comments segment last night brought some drama of it's own. 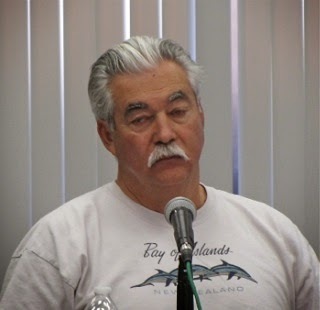 The first speaker was our old pal, Tea Party Tom Pollitt, who used his three minutes to mangle his presentation of support to Righeimer and Mensinger in the recent arrest of two Private Investigators for crimes they allegedly committed against the Mayor Pro Tem and Mayor. He mischaracterized the role of the activist organization, Costa Mesans For Responsible Government (CM4RG) as a "union organization, and mispronounced council woman Sandra Genis' name - referring to her as "McGuiness" several times. And, he had the temerity to "apologize to Righeimer and Mensinger on behalf of the taxpayers of Costa Mesa" for the alleged events. What nerve! He has no authority to apologize for me to those guys for anything somebody may or may not have done. He and his pals have assumed the mantle of a lynch mob. The guy is really a dolt! And to think that he actually ran for a seat on the Orange County Board of Education last spring! Perhaps the most interesting speaker was activist Cindy Black, who used a part of her time to read emails received as a Public Records Request regarding the Decomposed Granite path in Fairview Park that is still under investigation by US Fish and Wildlife. 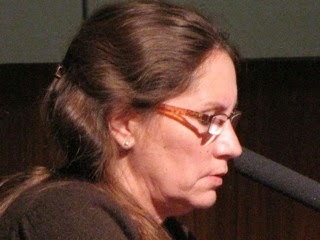 The emails she read portrayed Mensinger as a major participant in the establishment of the path. It apparently was his multiple requests to Director of Public Services Ernesto Munoz that launched the chain of events that resulted in a path wide enough to drive a truck on through vernal pools protected by the Federal Government. In the correspondence she read that path was referred to as "Steve's Path". It's my understanding that USFW will be moving forward briskly on this subject in this new year. It's possible that the city will incur significant sanctions for our shoddy stewardship of that site AND it's possible that those responsible may have some personal legal liability, too. We'll be watching this closely. 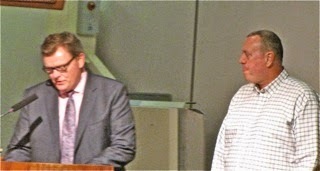 At the beginning of the meeting Mensinger made two (2) Mayor's Awards. The first was to retired Boys and Girls Club stalwart Harlan Anderson. A very nice video was played and he was presented with a proclamation praising him for his dedication to the youth of our community through several decades of service. The second presentation went to a new Westside restaurant, the Boathouse Collective. I don't recall this ever being done before, but my mind may be slipping. Anyhow, the video showed a "hot new spot" on the Westside surrounded by industrial sites. It's another of those "green" businesses that are being touted these days. Finally, we expected this meeting to be adjourned to a Study Session next Tuesday at which good old Mary Jane - Medical Marijuana - would be discussed. As it turns out, that meeting will be canceled and a Special Closed Session will be held instead. Nobody's talking about the subject of the closed session - yet. Who knows - maybe US Fish and Wildlife is coming to slap cuffs on some folks? Nah, I don't think so, either. By the way, this issue generated just about the only strife on the dais last night. Righeimer went on one of his rants about the Medical Marijuana issue and Foley followed-up by correcting the record. 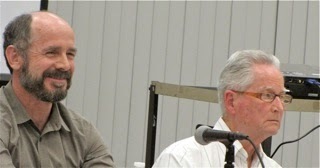 She described Righeimer's summation as "factually and legally inaccurate". During the discussion she referred to him as "Mr. Righeimer" and he immediately corrected her with a "Councilman Righeimer". She replied with "whatever". Actually, it should have been "Mayor Pro Tem Righeimer". Want a little smile? A friend contracts that title as "M-P-T", which, if you try to say it, can come out "Empty"... Somehow, that seems very appropriate and I smile when I think of it.